ZO® pigmentation solutions utilize novel formulations and innovative protocols to optimize the treatment of hyperpigmentation. ZO® Skin Health systems are the most effective treatments for all skin types. ZO® Medical and ZO® Skin Health products provide deep penetration and activation that optimize lasting results. New and expanded protocols support therapeutic treatments of acute and chronic disorders, and daily skincare. Many treatments for hyperpigmentation are outdated, ineffective and not compliant with FDA regulations. ZO® Medical solutions provide physicians a choice of HQ and non-HQ treatment systems to stabilize and correct a wide range of hyperpigmentation conditions. Hyperpigmentation is a skin condition in which areas of the skin become darker than the surrounding skin. Age spots, also known as “liver” spots, are a common form of hyperpigmentation found on the hands, face or other sun-exposed areas of the skin. Most forms of hyperpigmentation are harmless. There can be several causes of hyperpigmentation. Acne and other injuries to the skin can leave dark spots on the skin after it clears. Sun exposure is another leading cause of hyperpigmentation. Melanin in the skin absorbs the ultraviolet rays from the sun to protect the skin from overexposure. When this occurs, freckles and other darkened areas may appear. Broad spectrum sunscreen can help prevent skin damage and hyperpigmentation caused by sun exposure. Hormonal changes, especially in women, can cause melasma or chloasma spots. Pregnancy, birth control pills and menopause can lead to an overproduction of melanin, resulting in darkened skin on the face and abdomen. 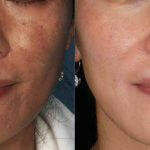 What are some traditional treatments for hyperpigmentation? IPL Photofacial treatment uses pulsed light to penetrate the skin. Collagen and blood vessels constrict beneath the skin to tighten skin, reducing redness and lines. The procedure lasts for about 30 minutes and the benefits typically appear gradually. Chemical peels involve the application of alpha hydroxyl acids (AHA), trichloroacetic acid (TCA), or phenol to the skin. The acid application exfoliates dead skin layers to improve texture and tone.